The holidays will be here before you know it. If you receive my monthly newsletter then you’re aware that the next few months I plan to share recipes for homemade “gifts from the kitchen,” that you can give as a hostess, shower or holiday gift. Most of us enjoy giving gifts to family, friends and co-workers during the holiday season, but with the economy in the toilet it makes it a bit harder on the pocketbook! However, creating homemade treats is not only affordable but it tastes better. Plus, you can afford to give to everyone on your holiday list and then some, and still have money leftover to throw a party! Last week I shared how to make homemade Limoncello. Today I’m going to share how to make Homemade Vanilla Extract. If you’re a baker then you know how often you use Vanilla Extract. 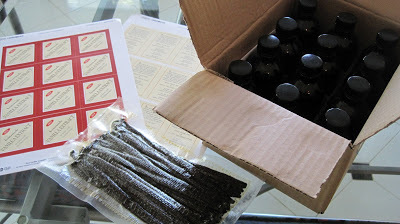 Pure Vanilla Extract which is what I’ll be sharing with you, can be $10-$15 for a 4 ounce bottle. To make your own it’s a fraction of the cost. Plus, I even had labels made for mine – I’ll share that with you in a minute. Homemade vanilla extract is so easy and fun to make. It’s not as strong as the store bought varieties but will have a fuller and fresher flavor. The best part though, is knowing you made it yourself. It doesn’t matter what alcohol you choose for making extract – it’s more a question of which alcohol you prefer. The flavor of Vodka doesn’t interfere with the taste of the vanilla and is what you’ll typically purchase in the stores. However, Rum or Brandy can also be used and are nice if drizzled over freshly baked cakes or added to stewed winter fruits. When I decided to make homemade vanilla I opted to order amber colored glass bottles from Specialty Bottle Company, although you can purchase Vintage Bottles which can be fun, or clear bottles. Since you’re making these yourself, whatever bottles or vessel you choose is up to you. For the Vanilla Beans I purchased in bulk, which saves you quite a bit. I ordered 50 Madagascar Vanilla Beans from Beanilla for a mere $38.99. 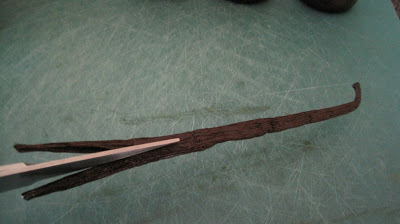 I love the aroma of the Madagascar Vanilla Beans and prefer those for making homemade extract and to use when baking. If you’re partial to another type, Beanilla offers a variety to choose from. Madagascar Vanilla Beans are superior, with flavor and aromatic qualities that make these beans the most popular and sought after vanilla variety. The flavor is rich, dark and creamy with an overwhelming sweet, buttery aroma. These are well suited for many baking recipes, drinks and desserts. To learn more about the various vanilla beans; the best types, how to store them, how to use them, how they’re graded and what makes them different, view here. Of course, to make your gift complete there’s nothing like a fancy label to adhere to your bottle. If you’re talented you can easily make your own. However, if you’re like me and don’t have the time or don’t have the technical skills, you’ll love going to My Own Labels. They literally have labels for everything. Be sure to check out each of these sites. I’m sure you’ll have fun browsing and may even find something you like, whether for Homemade Vanilla Extract or some other gift your creating. 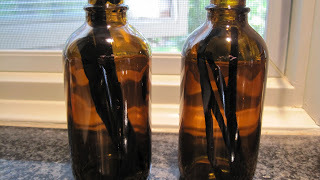 Below is the recipe for Homemade Vanilla Extract – I hope you have fun with it!…………..
Place one full split bean, folded in half, in a 4 ounce bottle. I use one bean per 4 ounce bottle and feel it’s enough. If you like you can add 2 beans for a fuller flavor. Note: Five beans per 16 ounces of alcohol is the ratio that the FDA requires for commercial production of a single-fold vanilla extract. This ratio is the most important aspect of making homemade vanilla. 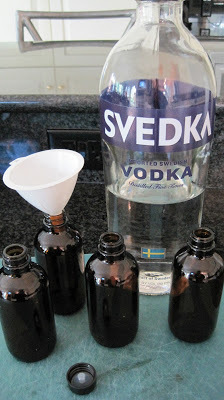 Using a funnel, fill with high-quality vodka, rum or brandy, covering the top of the beans. Seal bottles and let steep for 6 to 8 weeks in a cool, dark place such as a pantry. Shake the bottle 1-3 times a week, until ready to use. The extract will last practically forever. Eventually, the beans will lose their strength, but they should maintain their flavor for many months. Add more alcohol as needed to keep the bottle replenished – you will never run out of extract. At some point you might want to add a couple of split fresh vanilla beans to the bottle. Gifts from the Kitchen, Holidays/Occasions, Misc. That is a cool gift! I’d love to get homemade vanilla extract. I have to admit that I buy one from Costco and I don’t even know if it’s real one… You know it’s way too cheap to be real. But I wasn’t sure what’s really in vanilla extract I didn’t bother making from scratch. Since I don’t bake much, my vanilla extract doesn’t decrease as much as other home cook/baker. 🙂 I’ve never given a homemade gift from the kitchen. I’d totally consider this as an option (easier than canning… :)). Thank you for sharing Vicki! Homemade gift giving is always an option. I have found with the economy, it’s a great way for everyone to be able to give. Plus a homemade gift says so much more – it comes from the heart! I go through bottles of vanilla like it’s water so for me it’s a wonderful gift to give even to myself. I hope you’ll try it. Teachers would even like this! Really fun post! Never knew it was so easy to many vanilla extract. I’ve actually found decent stuff for under $10 (at Schnuck’s), but you’re right that usually the good stuff is expensive. Great idea – thanks for this. 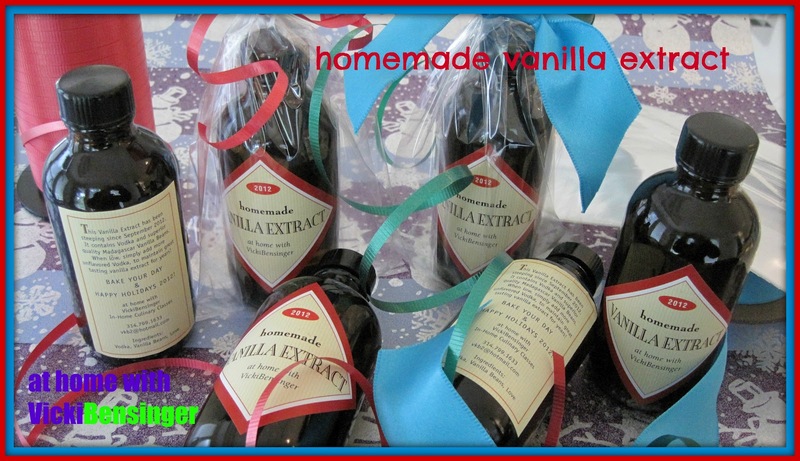 Since your wife is the baker in the house you can surprise her with a homemade gift of vanilla extract. To intensify the flavor you could add 2 whole ones instead of just the one. It does make a nice gift, plus it’s fun to make. Those receiving it are so surprised that they have Homemade Vanilla Extract. They cherish it. I start mine now and give for gifts in December. At that point that have steeped for 2 – 3 months and I know when I give it them they can use it. Then of course they can replenish. Although, it would be fun to give it to them early and let them shimmy and shake it! Here, How much can i add the vodka for making vanilla extract…??? Note: Five beans per 8 ounces is the ratio that the FDA requires for commercial production of a single-fold vanilla extract. This ratio is the most important aspect of making homemade vanilla. Oops I meant to say Five beans per 16 ounces (pint)of alcohol is the ratio required by the FDA for commercial production. Glad I caught that! Hi Vicki, what a wonderful idea! I’m wondering where you get your vanilla beans and the bottles you used in this blog? I can buy vanilla beans in vials of 2, but they are expensive. And the bottles, I have no idea! Thanks! Hi Kathy, if you look up at the top just prior to the recipe there are links hi-lighted in yellow. Beanilla is where I get my beans at a very affordable price and Specialty Bottle Company for the bottles. Hope that helps. What a wonderful idea, Vicki! I’ve never tried making my own vanilla extract but would love to try. Your amber bottles and labels are so nice for gift-giving too. Thank you for all of the links! I think you’ll find you love making it, especially if you’re a baker yourself. Sure beats the cost of buying it at the store and not only can you satisfy your needs but also gift it. Thank you Nicole. I hope you make this simple and delicious vanilla extract. It’s fun and easy to make. Plus it makes gift giving affordable. This is SO EASY and what a COOL gift! Thanks for sharing this fabulous idea! Vicki, this is a wonderful idea, so much easier than I thought. 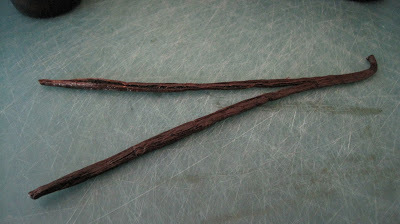 And thanks for the great tips on where to purchase vanilla beans – what an AMAZING price! You’re welcome Chris. I had a friend stop over today as I was finishing up my last bottles. I still had a jar full of vanilla beans and told her to smell them. She text me later to say after leaving my house she could still smell the incredible aroma. I agree Catherine, plus purchasing the vanilla beans in bulk keeps the cost down especially with the wonderful prices at Beanilla and their quality beans. Each bean is so plump and smells heavenly! Making the vanilla is a nice gift for many occasions. Even as a party favor for a luncheon, teacher gift, for me it’s nice to give to my students, shower gifts, holiday gifts – you name it. If you love to cook, you’ll enjoy the vanilla. I made 2 bottles of extract last year and it smells so good after soaking 6 months in vodka. I gave my MIL a bottle and need to make some more! I know it sure beats spending $10+ for a bottle at the stores when you can make a batch for a fraction of the cost. Vicki, what a super series for all your homemade gifts. Gosh, it’s true – we should be thinking of this now! 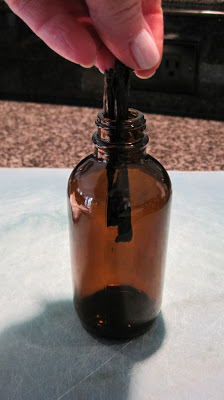 Homemade vanilla extract is such a wonderful idea and great for thinking about budget too. Bravo. I agree Jill for you, I could see giving it as a gift, attached with a recipe for your wonderful Macarons.